Opening night: Saturday, March 15; 7:30 p.m. Remaining performances: March 20, 26 and 29 at 7:30 p.m. March 23 and April 6 at 2 p.m.
Preconcert lecture by LAO Music Director James Conlon one hour before each performance. Russian coloratura soprano Albina Shagimuratova will sing the title role in Los Angeles Opera’s new production of Donizetti’s “Lucia di Lammermoor,” which opens Saturday night at the Dorothy Chandler Pavilion. Photo by Robert Millard for LA Opera. 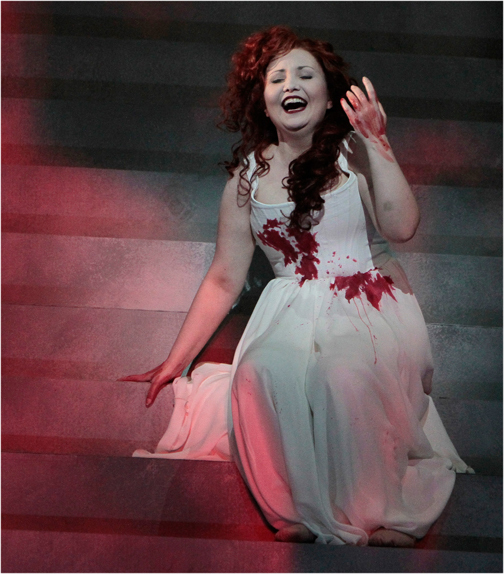 It’s been a decade since Los Angeles Opera last presented Donizetti’s Lucia di Lammermoor. On Saturday night at the Dorothy Chandler Pavilion LAO will use a new production by Elkhanah Pulitzer, one of two created by LA Opera this year (the other was “Falstaff” last November). Therein lies a (back) story. According to Rupert Hemmings, LAO’s Senior Director of Production, the company tries each season to use a mix of approximately two new productions, two revivals and two productions that it rents from other companies. The current season would have followed that formula except for the additions of Philip Glass’ Einstein on the Beach and André Previn’s A Streetcar Named Desire to the schedule, plus a last-minute decision (in opera scheduling terms; it actually took place about six months in advance) to substitute a unique production of Mozart’s The Magic Flute that Barrie Kosky created for Komische Oper Berlin, instead of using LAO’s own production designed by cartoonist Gerald Scarfe. As to the two additions: Einstein is a unique, one-off opera; from a practical and financial point of view, Robert Wilson’s design couldn’t — and perhaps shouldn’t — be re-created, while Streetcar is a semi-staged production that was essentially created for soprano Renée Fleming, who is coming to Los Angeles for the three performances May 18, 21 and 24. Of the seven operas on next season’s schedule (not counting Dog Days, which will play at Walt Disney Concert Hall’s REDCAT Theatre), two — The Ghosts of Versailles and Hercules vs. Vampires — will be new productions while four — La Traviata, Florencia en el Amazonas, The Barber of Seville and The Marriage of Figaro — will be revivals. Only the evening that pairs Purcell’s Dido and Aeneas with Bartok’s Bluebeard’s Castle will be a rental, in this case from Frankfurt Opera. LAO’s new production of Lucia di Lammemoor will be the first main stage production for LAO by Pulitzer, who created the company’s 2008 community production of Handel’s Judas Maccabeus at the Cathedral of Our Lady of the Angels. It’s the biggest opera assignment yet for Pulitzer, who is the great-great granddaughter of Joseph Pulitzer, founder of the St. Louis Post-Dispatch newspaper and creator of the Pulitzer Prizes. Her production will use digital imagery by Wendall K. Harrington and scenery by Carolina Angulo, who also designed LAO’s production of Jonah and the Whale, which will play next week at the nearby cathedral. Christine Crook will make her LAO debut as costume designer and Duane Schuller returns as lighting designer. The question of whether to revive, rent or create a production surely vexes all opera companies. Finances play a role in the decision but recent improvements and expansions in video and computer-generated capabilities — and the public’s delight in them — leave companies with the question of whether to re-mount a production, create a new one, remodel an existing production or rent a production from another company. ‘There are a number of factors at play,” says Christopher Koelsch, LAO’s President and Chief Executive Officer. ‘Tastes, of course, change over time. A production in consideration for revival may no longer reflect the aesthetic direction of the house and its artistic leadership. There are also singers for whom we would wish to produce a particular production or who have a particularly felicitous relationship with a certain stage director. Similarly there may be a stage director or designer whose work we feel is important to be seen in our community. Another factor is that, while video imagery and CGI have added dramatic impetus to many new productions, designers — much like artists being asked to alter paintings — are hesitant to tinker with an existing production. Not only does LA Opera rent shows from other companies, it’s also active on the flip side. Companies around the world have used more than 50 LAO productions from the company’s 29 seasons. Several are currently being shown around the world. Verdi’s The Two Foscari, which opened the 2012-2013 LAO season, was a co-production with Valencia, Spain; it played last December in Vienna and will be mounted this spring at the Royal Opera House, Covent Garden in London. 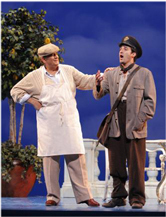 Among recent LAO productions, one of the most popular is Il Postino (right), by Daniel Catán, which LAO premiered in September 2010. Since that highly successful debut the production been seen in Paris, Vienna, Santiago (Chile) and at the Cervantino Festival in Mexico. It just returned from Madrid. Other popular LAO productions are Il Trovatore, Tristan und Isolde and L’elisir d’amore (the latter recently appeared in San Diego). Salome, which was part of the company’s original 1986-87 season, was popular for years afterward, says Hemmings. And the calls keep on coming. LAO’s 2008 production of Otello will play at Houston Grand Opera in the fall and its Gianni Schicchi, directed by Woody Allen, will be presented in Madrid next season. Notwithstanding those rentals (which do pour much-need dollars onto LAO’s bottom line) possible rentals are not the primary concern when the company commissions a new work, says Hemmings. “If the production is going to be a co-production,” he explains, “then we take into account the needs of all the co-producing companies in great detail.” This production of Lucia di Lammermoor is a stand-alone effort. “[Of course] we always hope that a new production will have a long successful life in L.A. and in other houses around the world,” says Hemmings. Production qualities aside, Lucia almost always succeeds or fails because of the title character, who must rise to the occasion in the famed “Mad Scene” that is the opera’s climax. “Despite its enormous popularity, Lucia di Lammermoor isn’t easy to produce,” says LA Opera’s General Director Plácido Domingo. “There is little point in scheduling this opera without a truly special leading lady. her LA Opera debut in 2008 as the “Queen of the Night” in The Magic Flute. Joining Shagimuratova will be Albanian tenor Saimir Pirgu as Lucia’s secret lover, Edgardo, baritone Stephen Powell in role of Enrico, and bass James Creswell as Raimondo. James Conlon will conduct the LA Opera Orchestra. Of note: one of the instruments will be a glass harmonica, to be played by Thomas Bloch (LINK). How Pulitzer translates all of that into her new production will be one of the eagerly awaited intrigues on Saturday night. • The performance will be sung in Italian with English supertitles. It runs approximately 2 hours and 40 minutes with one intermission. • Conlon will offer a preview an hour before each performance. They’re always worth hearing, even if you know the opera well. We advise that Lucia di Lammermoor is not suitable for children under 12.